» Crew members nicknames colors. I have an idea for colorful nicknames of our crew members as it is with friends. Or a small icon with a nickname on the list of players. Re: Crew members nicknames colors. 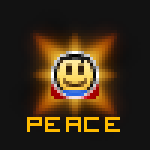 Then if you add crew members and world owners like peace said it's gonna just be about having a colored username. It's not special anymore when everyone has it. Then we might aswell just make it so you can buy colors but any of the colors from the roles listed above. For example a pink name, or red, or yellow (but brighter than patreon) or whatever. I'd suggest making it a slight off-white, with a special dark-green for friends that are also in the crew. The icon could also work, though.